Obama-endorsed #Occupy goons hope to shut down West Coast ports tomorrow. Anti-Wall Street protesters, hoping to briefly cripple a key supply chain of American commerce and re-energize their movement, plan to attempt to block major West Coast ports on Monday. By marching on U.S. ports from California to Alaska, organizers look to call attention to economic inequalities in the country and a financial system they complain is unfairly tilted toward the wealthy. The planned action comes after the Occupy movement that began in New York in September has seen its tent camps in most big West Coast cities dismantled in police raids, leaving the movement looking for new avenues to voice its discontent. But a plan to shutter multiple ports simultaneously could prove difficult because some of the facilities are in massive complexes with multiple entrances that would be tough to fully block, even if large numbers of demonstrators turn out. 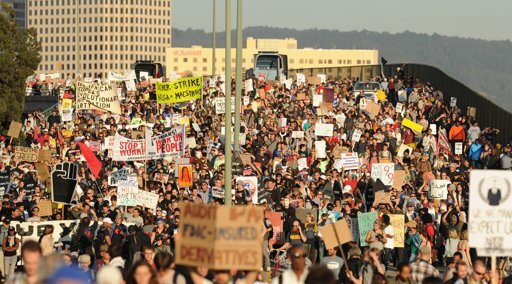 Activists aligned with the Occupy Wall Street movement did briefly succeed in shuttering Oakland’s port, the fifth busiest in the nation, for hours on November 2 after police kept their distance. Obama’s former Green Czar called for the closing of the western US ports on Monday.